Flag of Liverpool Football Club, the official version proposed was adopted in 2000, Liverpool Football Club is an English football club. The flag is composed of a red background, in the second and third canton is the vertical writing Liverpool FC, in the center of the flag is the Liber Bird, a mythological bird composed of half eagle and half Cormorant. The team was founded on March 15, 1892. Liverpool players are also called the reds (The Reds) and play at Liverpool's Anfield Stadium. The Liverpool team have won 18 league titles, seven England Cups and seven League Cups. Liverpool is the most successful English club in European competition. 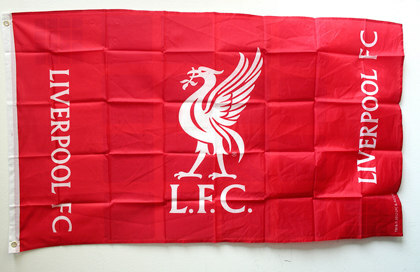 Price Alert "Liverpool Football Club Flag"?